In yet another miraculous drama, Prophet Rufus Phala of AK Spiritual Christian Church in Makgodu, Limpopo, South Africa made his church members drink Dettol. 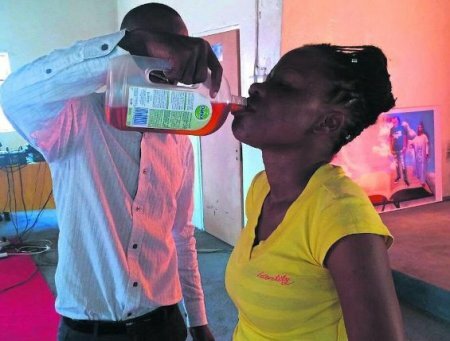 The pastor claimed the antiseptic liquid will heal their sickness. According to Daily Sun SA, Prophet Rufus told the congregation to drink the disinfectant, promising they will be healed of their sickness. "I know Dettol is harmful, but God instructed me to use it. I was the first one to drink it," he claimed, adding that he has been getting WhatsApp messages from people who say they have been healed. One Dr Mabowa Makhomisane, said Dettol is harmless when mixed with bath water or when cleaning a wound. "But if it goes into your stomach and gets absorbed into your body, it decreases the amount of oxygen in your system," he said. "This might cause to you collapse and die. If you vomit the liquid into your lungs, it causes aspiration pneumonia. Your lungs will get swollen and you won’t be able to breathe." he added.